Randers Regnskov is a sense bombardment af nature experiences. 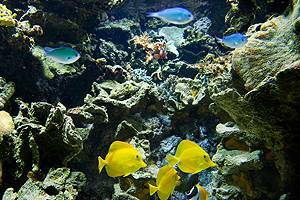 The air is hot and humid and filled with noises from the multifarious animal life. 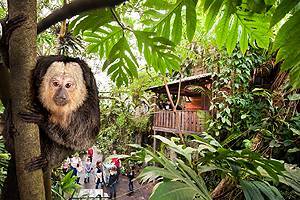 In the treetops above you the monkeys jump around and play, while bats and sloths are resting. 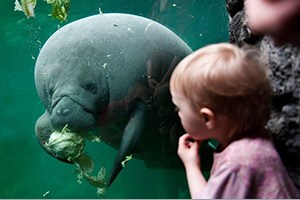 On the forest floor the leafcutter ants work tireless, dragging the heavy leaf pieces down in their nest, while the manatees swim quietly around and the komodo lizards laze in a sunny spot. 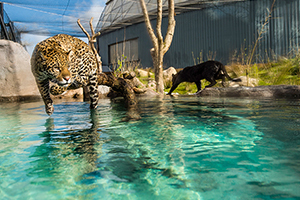 Meet our two fantastic jaguars in their brand new facilities with pool as well. 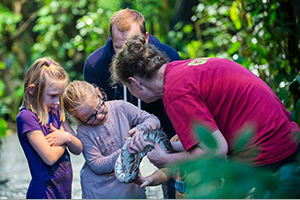 During the summer you can also go exploring in our snake temple, where you walk around among genuine, live boa constrictors. 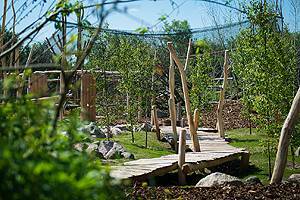 Or visit DanmarksParken, where you can pat the sweet farm animals or visit the large nature playground.